It’s no secret that blogging can be a great boost to your local rankings and to your ability to attract new customers. Google loves useful info. More importantly, so do the people who come to your site and decide on the spot whether to pick up the phone or check out your competitors. When done right, blogging is a win-win-win. But far too many business owners try it, expect immediate results, and give up. The result is that their blogs last about as long as a case of Natural Ice in a frat house. You can get all the guidance you need from Mr. Local Blogging himself. I won’t even try to add to his suggestions, other than to say you need to read them. All I want to do is offer 10 real-life examples of “local” blogging done well. These aren’t fairy-tale examples, either – like in the tourism industry, where the business owner can think of blog posts without even thinking, or where the author is a full-time blogger and doesn’t have a business to oversee. They’re businesses of all stripes. Some of them are like yours, with probably all the same challenges and opportunities your business has. A great example of a beefy blog – not only in terms of the posts themselves, but also in terms of how they’ve piled up over the years, just because the author stuck with it. A great variety of posts, but all pretty relevant to tutoring. Nice photos, too. I could show more examples, but I think you get the idea. You might be wondering: Why are these blogs good? Because they put humans first, search engines (a distant) second. The posts are written to be useful. Sure, there are keywords in there, but they’re not stuffed in there like clowns in a Volkswagen. What do they show you? 1. Your posts don’t need to be amazing, let alone perfect. They just need to be at least a little useful or informative. 2. You don’t need to write long posts. 3. You don’t need to post every day (or every week). 4. You don’t have to write about the same topic every time. Variety is good. It’s OK to get off on tangents – as long as what you write about is tangentially relevant to your services, your business, or your city. 5. You can do it regardless of what industry you’re in. Now try – if you can – to give me even one reason why you can’t do something similar for your business. “they put humans first, search engines (a distant) second.”. Blogging about family or using a blog as an on line journal is nice. In fact, I encourage it. I’ve done it. However, if you have something useful to share with the world, why not say it? Help the community. Be a part of “community”. Don’t be an individual. That has never been our purpose as a human family. Thanks, James. And nice job on the blog! Love that ‘tag’ line, “in reference to key words, “don’t have to be stuffed in..like clowns in a Volkswagen”. I’m actually guilty of that on my web page, hosted by Go Daddy. They want pages on websites to be in excess of 300 words. With 300 words, the writer ends up watering down the key word density. So, yes, here come the clowns. Shameful. But, I paid for the website, now I have to follow the rules for SEO. Actually, you are the expert. Is the three hundred word rule, Go Daddy’s rule or just what it has to be to reach key word density and interest readers? Honestly, I think 300 words is a bit much if the content has to be stretched. But I’d suggest using a real light touch on the keyword-density. It’s just not a big factor, and I wouldn’t even think about it when figuring out what to put on your homepage. It sounds like GoDaddy’s rule is more a suggestion than a “hard” rule. There are plenty of thin pages out there on sites that rank well (think photographers’ sites). But 300 characters is a good length to try for. For someone new at editing a website, to be presented with a check list for Search Engine Optimization, the newby, myself is going to believe the check list must be completed to the specifications of the website host. I did. I believed, up to this point, I had to follow Go Daddy’s SEO check list or my page would fail, miserably. In fact. I’ve done everything Go Daddy said to do. I have a 99% completion of their checklist. Impossible to get a 100%. That would be due to “how do you put 300 words on a site map? I suppose someone could figure out how to fill a site map with 300 words and fulfill Go Daddy’s check list. I’m getting 99% of it completed because I have 15 pages completely finished in Go Daddy’s prescribed system of SEO. Any way. Sorry to stump you on the “Requirement” thing. Or, as I said, “Rule”. Again, please understand, my experience at SEO is novice. So, when Go Daddy says I need 300 words, it sounds like a rule. Yeah, those are just rough guidelines. As long as you’re using the same good approach throughout your site that you use for your blog, you’ll be in good shape. Oh wow, on the sewer one “You don’t have to replace a failed septic system” is genius as far as relevancy, use, and interest goes. Nice pick. That’s a keeper, all right! The Search Engine Optimization check list had me believing as James had. Now I look like I’ve joined the clowns in the Volkswagen. I wonder, if we retreat a little on the story in the body, cut back (below the index percentage shown) on key words, if that will help our rank on our pages for Anchor Sewer and Drain Cleaning? The keyword-density would have to be pretty extreme for Google to penalize you based on it alone. As long as it reads naturally, you’re on terra firma. Aside from that, your title tag needs some work, and the name/address/phone should be on every page. That’s some low-hanging fruit right there, as far as your local rankings are concerned. 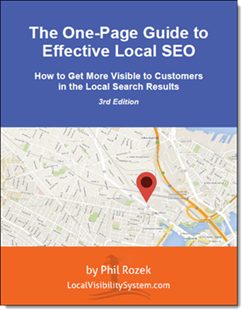 Thank you for using our site as an example Phil and for your great work in helping us improve our local visibility. My pleasure, Sandra. You and Dan do a great job! I’ve been seeing opinions on the necessity of having a listing in DMOZ and Yahoo. How necessary is it to have a listing in these directories.? Is it worth paying for? I understand, if I can get someone to link to me who is in the directory, the search engines will pick my website up and I will be included in the directory. It’s worth being listed in local.yahoo.com, but not in the pay-to-play general directory listing (which I think Yahoo still offers). DMOZ is a fine link, but it’s a one-horse site run by crusty old Open Source hippies, and they haven’t been able to keep up with the sites that are relevant in the 21st century. My guess is that inclusion there isn’t worth as much as it used to be, but I could be wrong. It’s worth submitting your site to DMOZ, but unless your site is 7-10 years old or you know one of the editors and paid for his family’s vacation to Disneyland, I’d have real low expectations. Wow! A great list of local business that “get” the importance of blogging. I know some of these are clients of yours, but how did you go about finding these out? I would love to create a list of my own, but wouldn’t know where to start. Any ideas? It wasn’t too hard to find some of those good blogs. As I recall, I’d mostly type in things like “service/type of business + blog” or “city + service/type of business + blog.” Then I’d see which search results represented blogs run by “local” business owners. Thanks Phil! That makes perfect sense. I am doing some research now. Thanks again for the idea and the pointer on how to search for them.